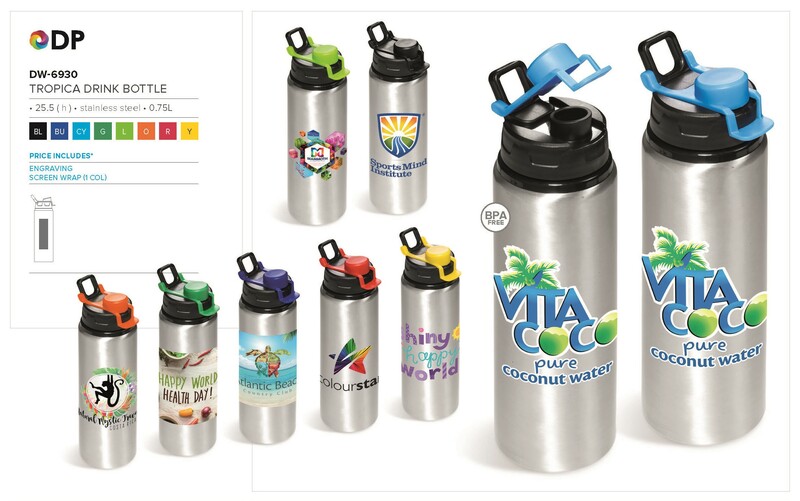 We have a wide selection of metal drinkware which can be branded in full colour. 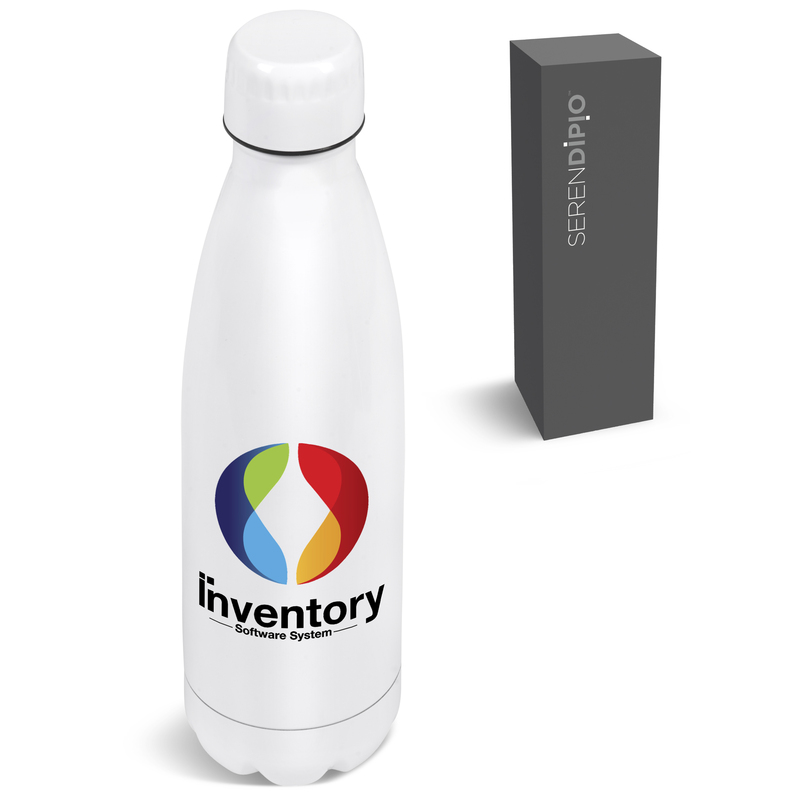 Supplied with or without branding. We service both corporates as well as individuals, with 99% of our items not subject to minimum order quantities. Please note this is not our entire range, so contact us if there is something specific you are looking for and we will find it for you. BPA free hence safe aluminium. Available in 3 colours. Screw on cap. 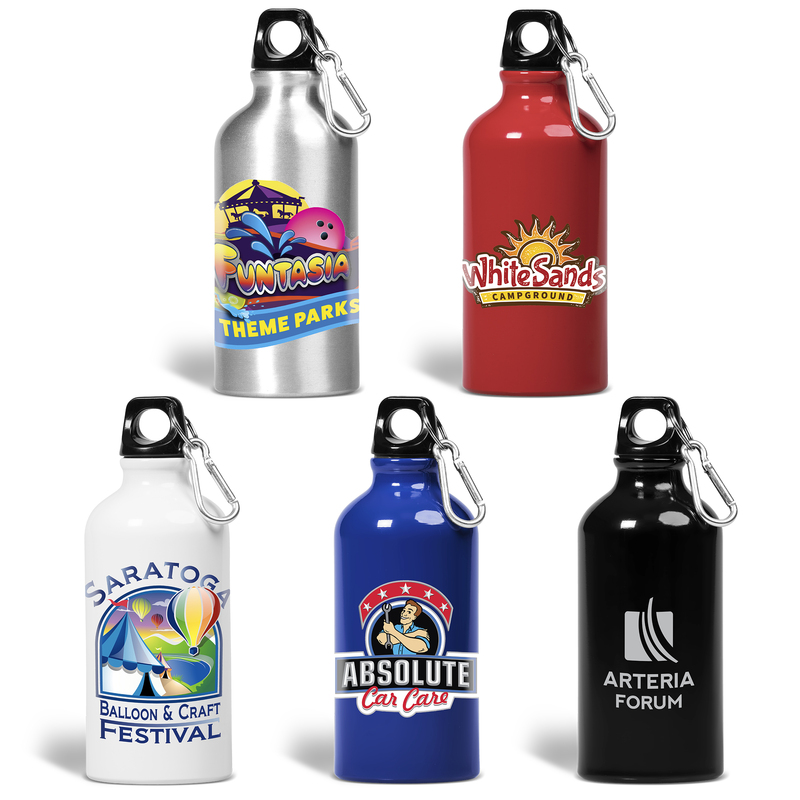 Matching carabiner clip on cap making it great for sporty & outdoor activities. Hook onto backpack for convenient carrying. 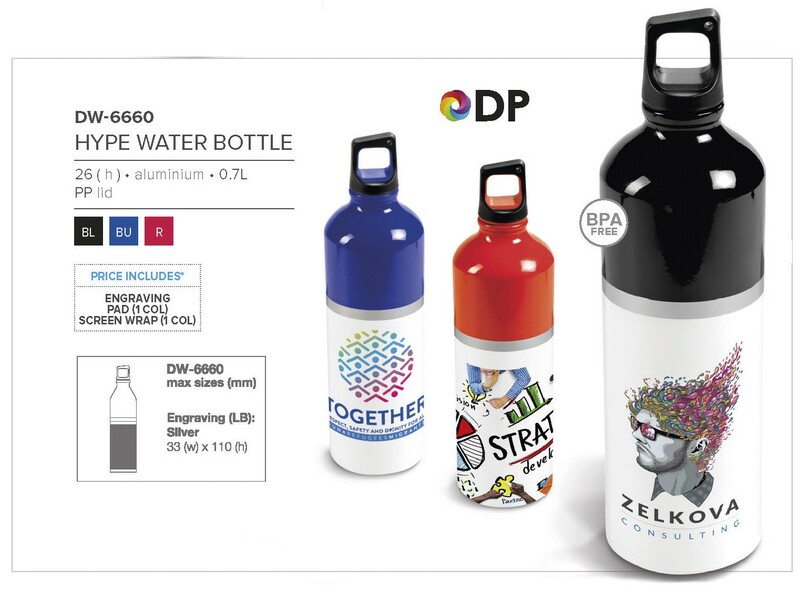 The silver bottle only will look great with Digital transfer full colour print. Laser engraving possible on all colours. Available in a variety of 6 bright & bold colours. 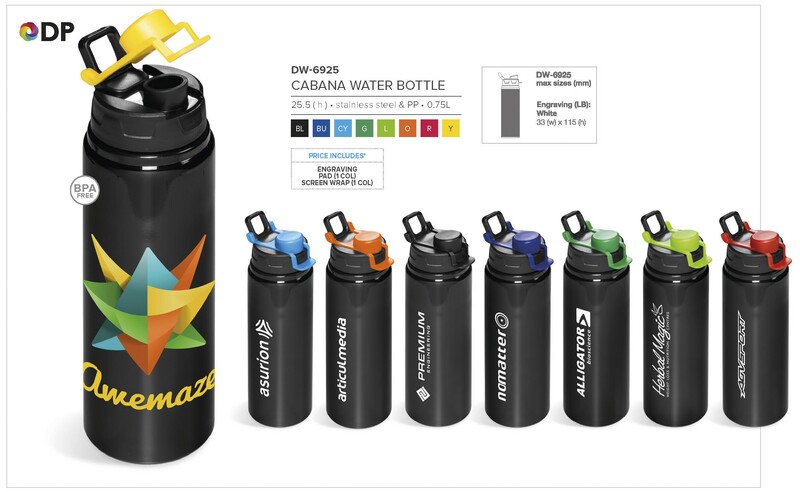 This vibrant tumbler has an eye catching easy grip rubber sleeve & matching flip top spout 450ml. BPA free. 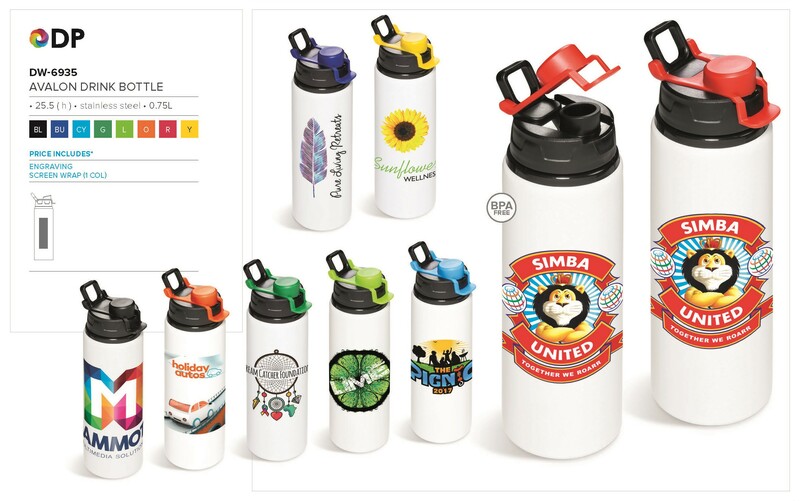 Durable, safe, great quality and BPA free. 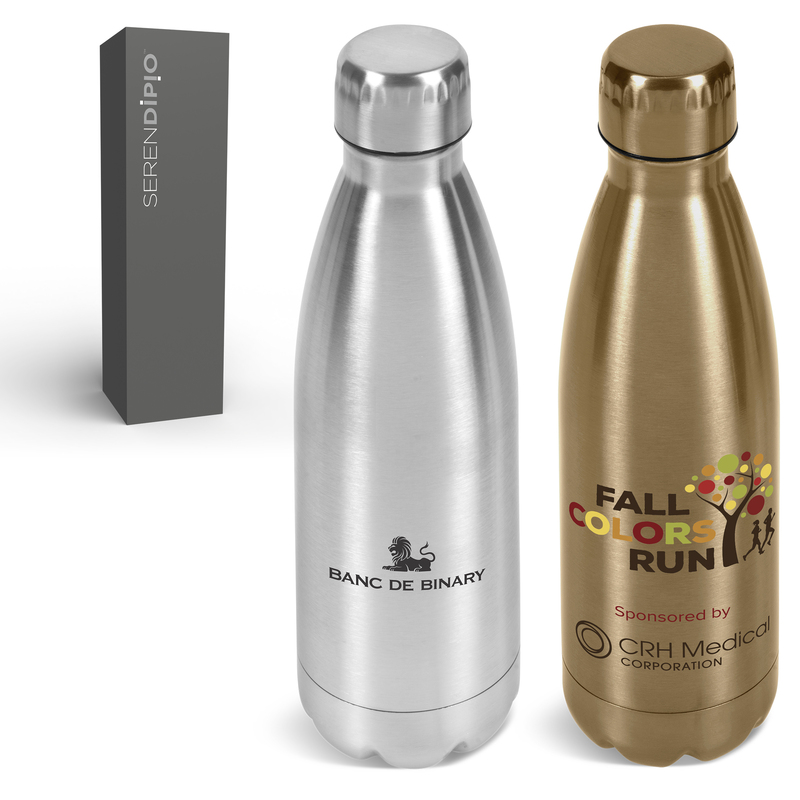 Beautiful 3 tone traditional aluminium bottle . Unique carrying handle lid. Wide lid for easy clean and fill. Flip-top spout for easy drinking. Stylish & durable. Comes in 2 colours. Unique slide-open colour accented lid. Wide screw on lid for easy fill and cleaning. BPA. 450ml. 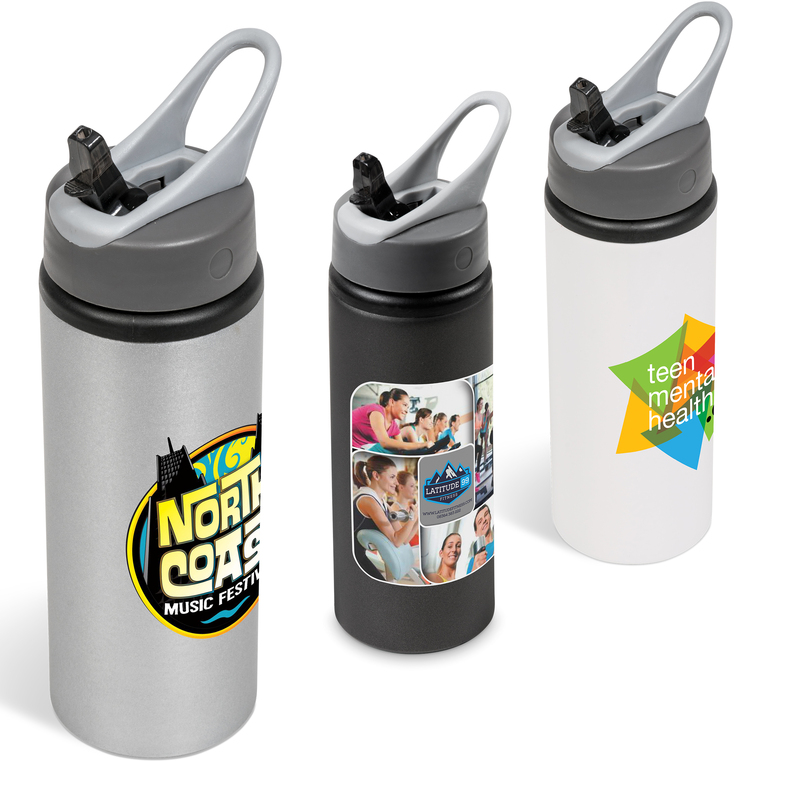 Trendy with a unique colour accented flip top spout with carrying handle. Full colour digital transfer print will look great on these. Beautifully colour contrasted. Available in 6 stylish colours. Colour accented screw open top with carrying handle. Carabiner (not included) can be clipped onto lid. Full colour digital transfer print will look great on these. BPA free. Our high quality usb mug makes a great and useful gift. 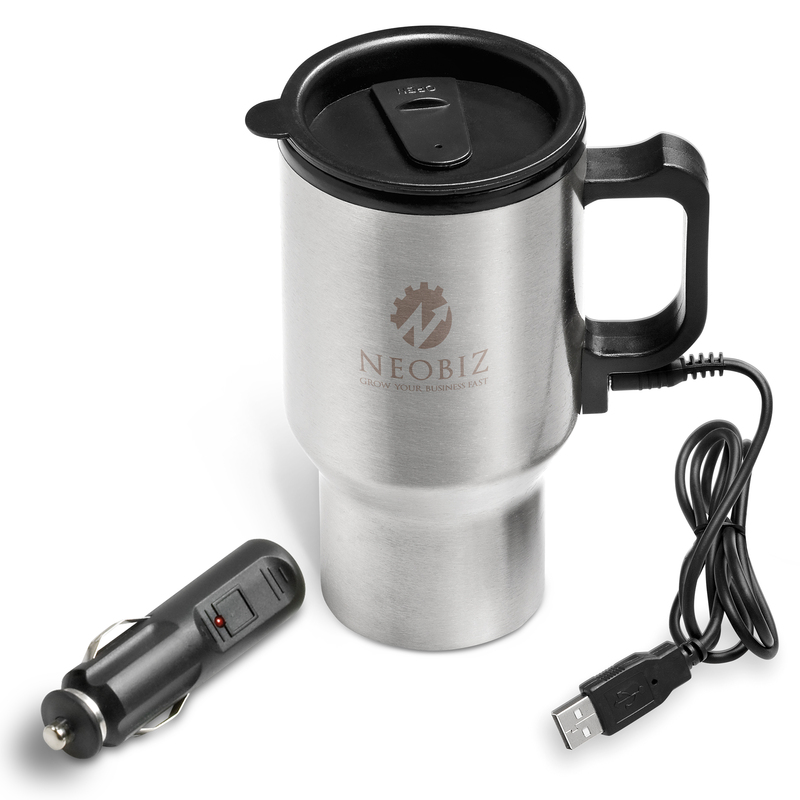 Power cord plugs into car lighter or USB plug to heat cup contents .Tight removable lid discourages spills. 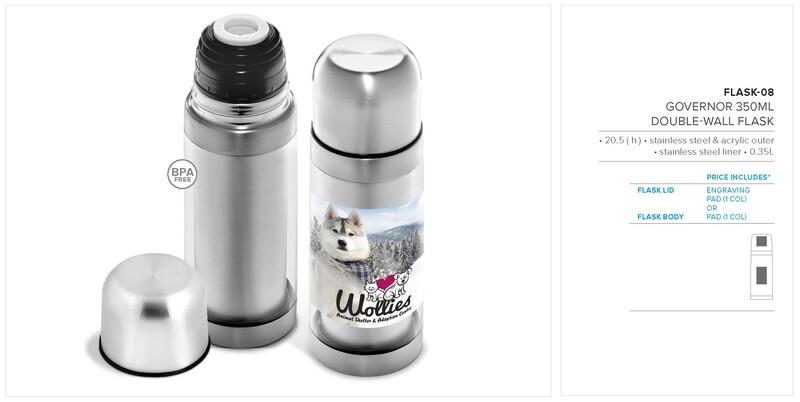 Includes: car lighter charger : USB plug •stainless steel outer / PP liner / 0.45L / 17 ( h ) Please note that, we can’t apply Digital Transfer on this item. This modern, stylish upmarket design is a must-have. 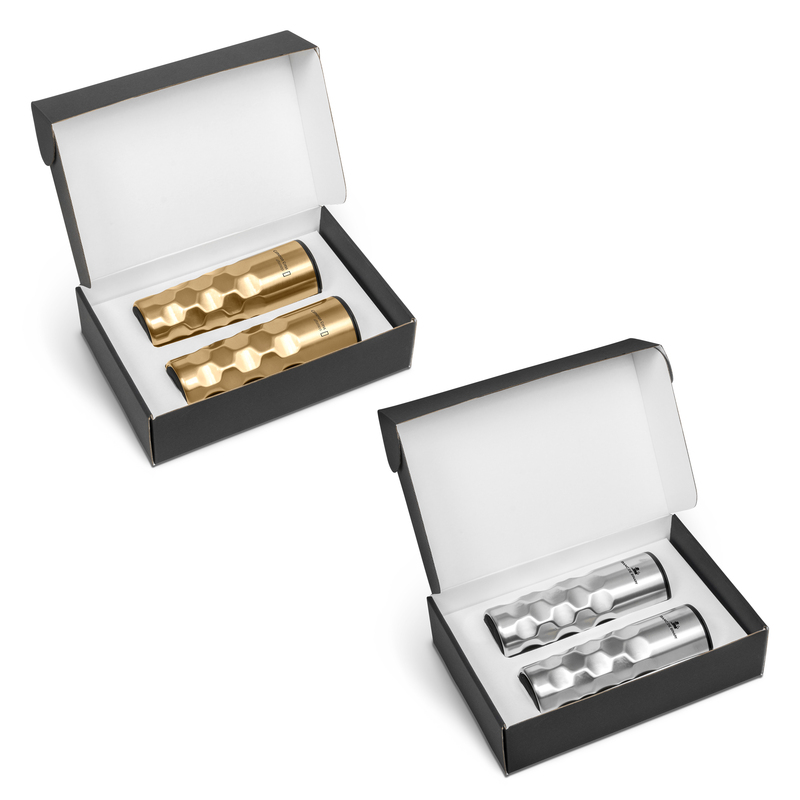 Exceptional quality available in a stunning gold or silver. Drink it hot or cold. 2 lid options, screw on with slide spout and straw in. Spill proof. 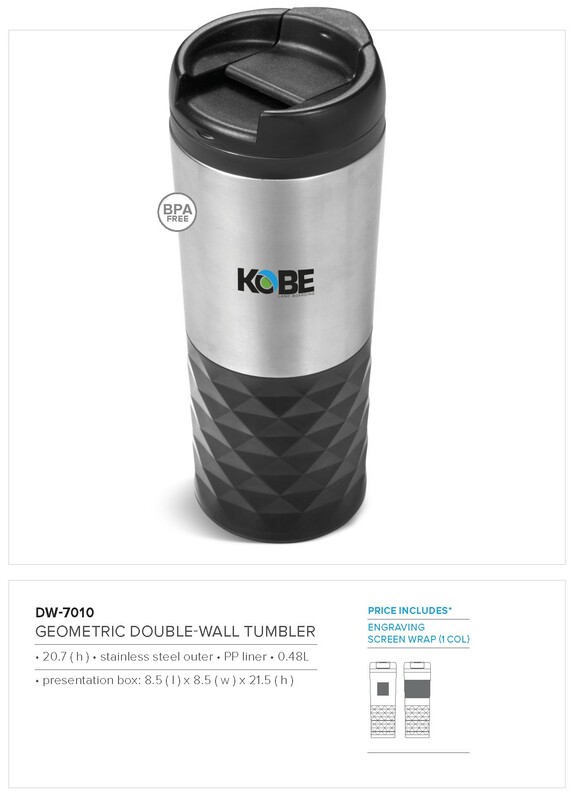 Makes a great travel mug for any executive. Available in 2 colours. Double walled. Easy pour button release which auto closes when cup lid is closed. BPA free. Beautiful silver flask, 500ml. 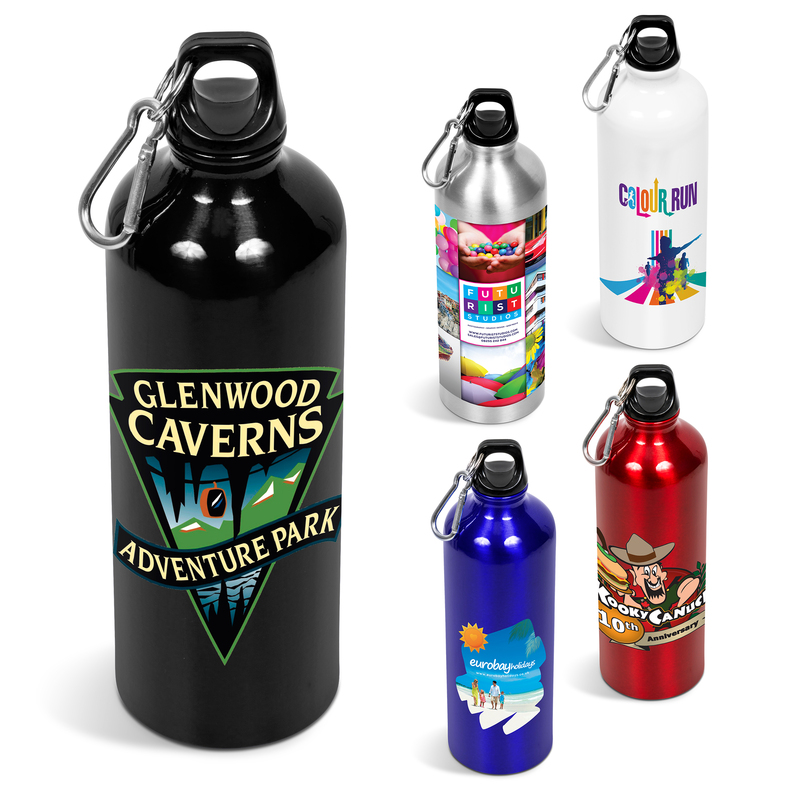 Double walled with an easy pour button release which auto closes when lid is closed. BPA free. Presented in a pre-branded box. 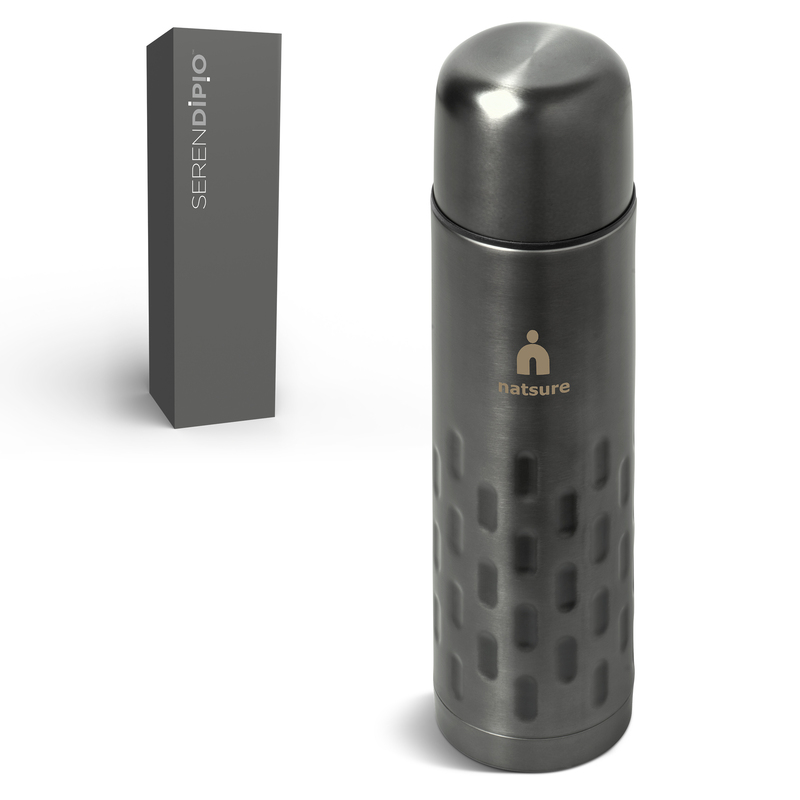 Want something that has more capacity, then look out for the 750ml -Flask 6631. Makes a great outdoor gift. Comes in 4 vibrant colours with matching boxes. 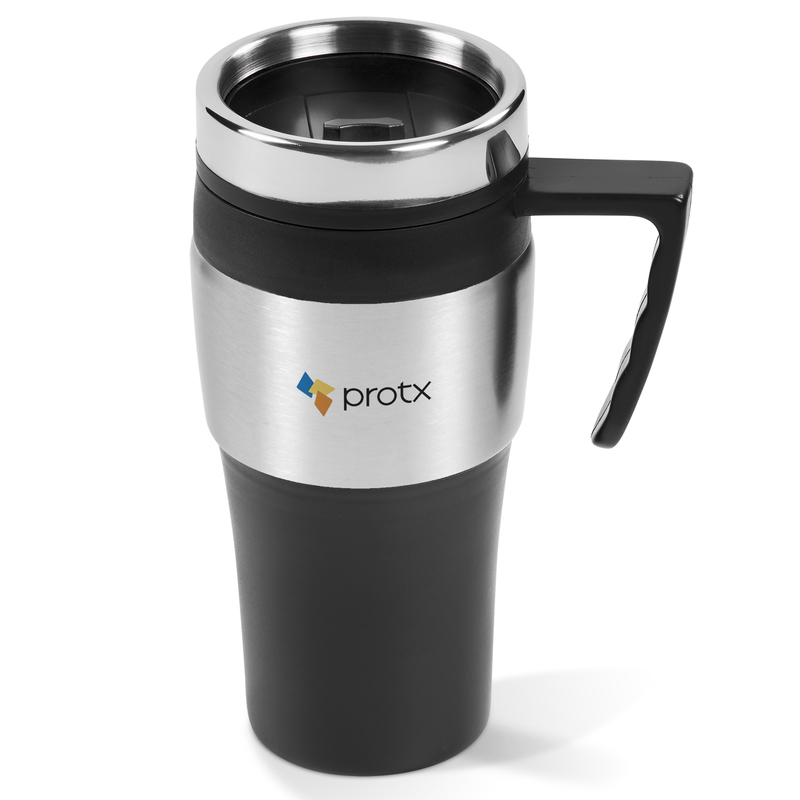 Double walled with an easy pour button release which auto closes when cup lid is closed. BPA free. 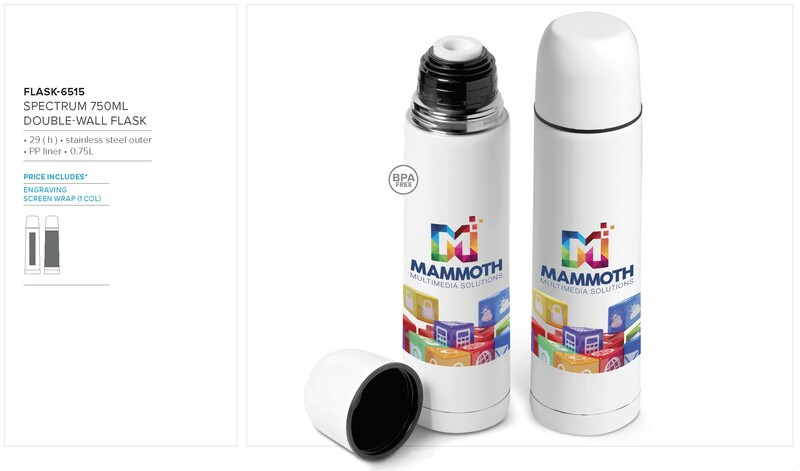 Great branding area and full colour digital printing available for the white flask only. Beautiful silver flask, 750ml. 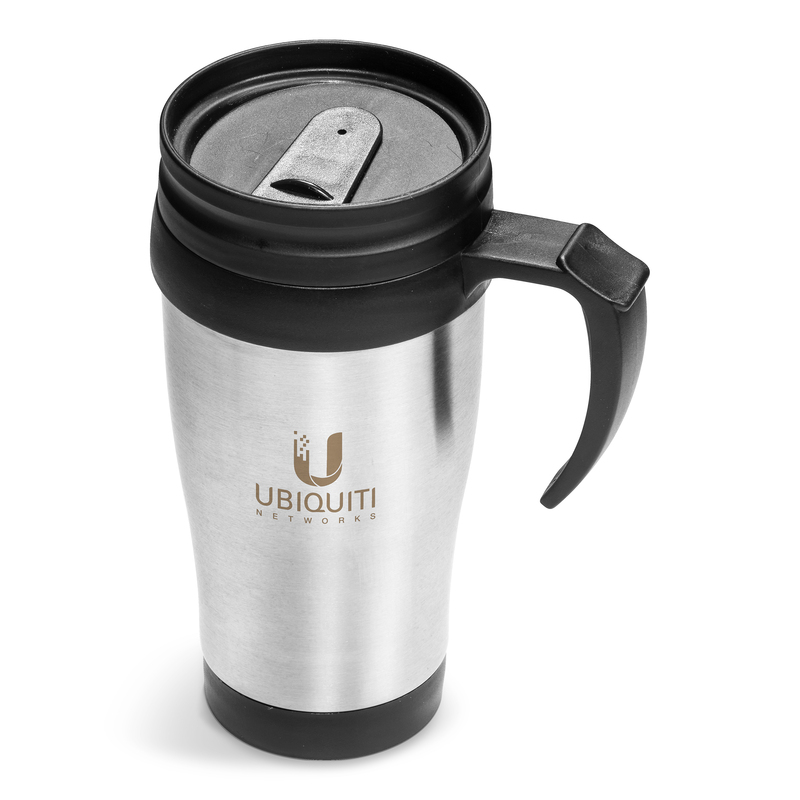 Double walled with an easy pour button release which auto closes when cup lid is closed. BPA free. Presented in a pre-branded box. 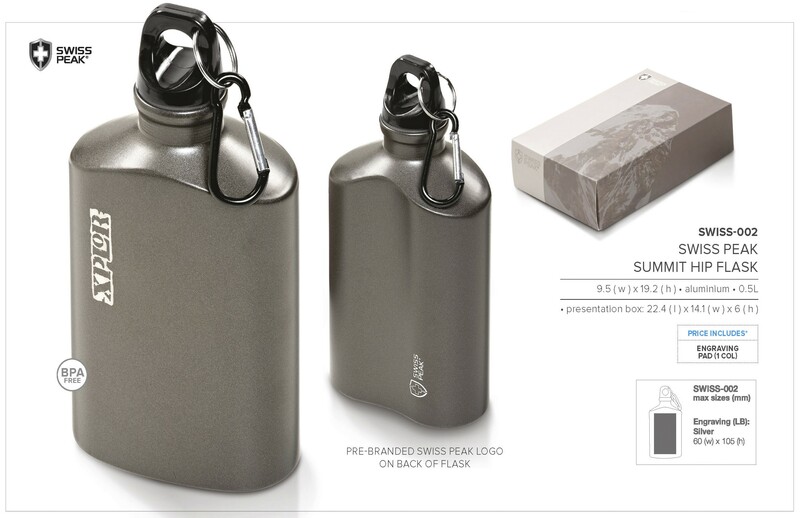 Want something more compact, then look out for the 500ml -Flask 6630. Makes a great outdoor gift. 1 x white ceramic which will look great branded with our full colour digital transfer. 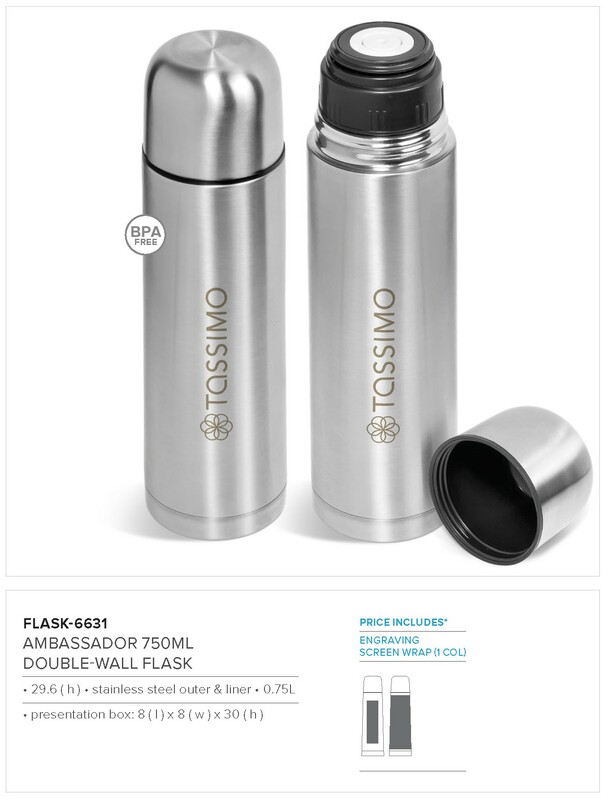 Flask has easy pour button which auto closes when lid is closed. 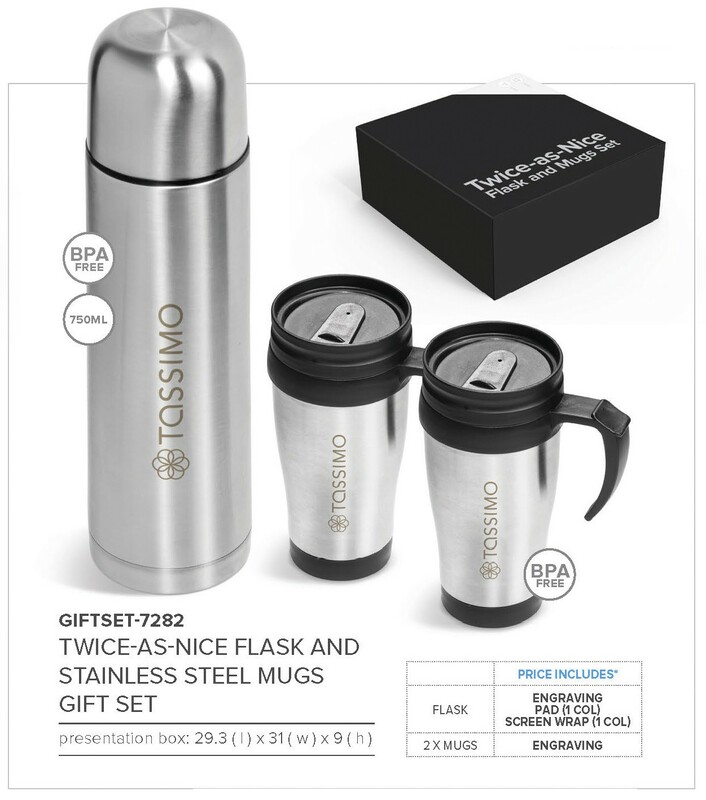 Catering for two, then look out for the stunning 750ml set with two mugs- Flask-6635. 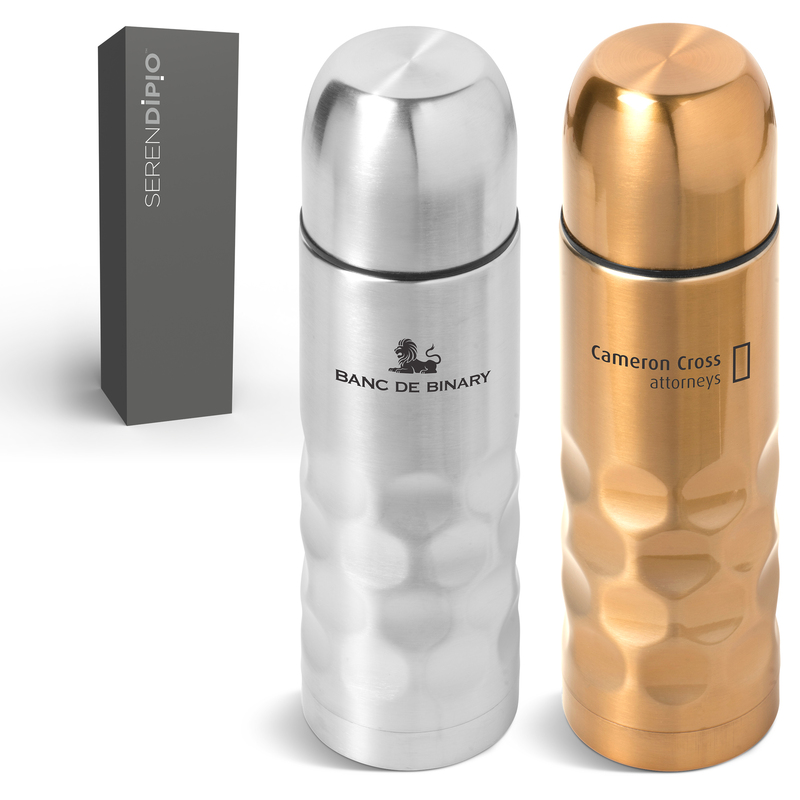 Our popular admiral flask set is available in 2 great colours. 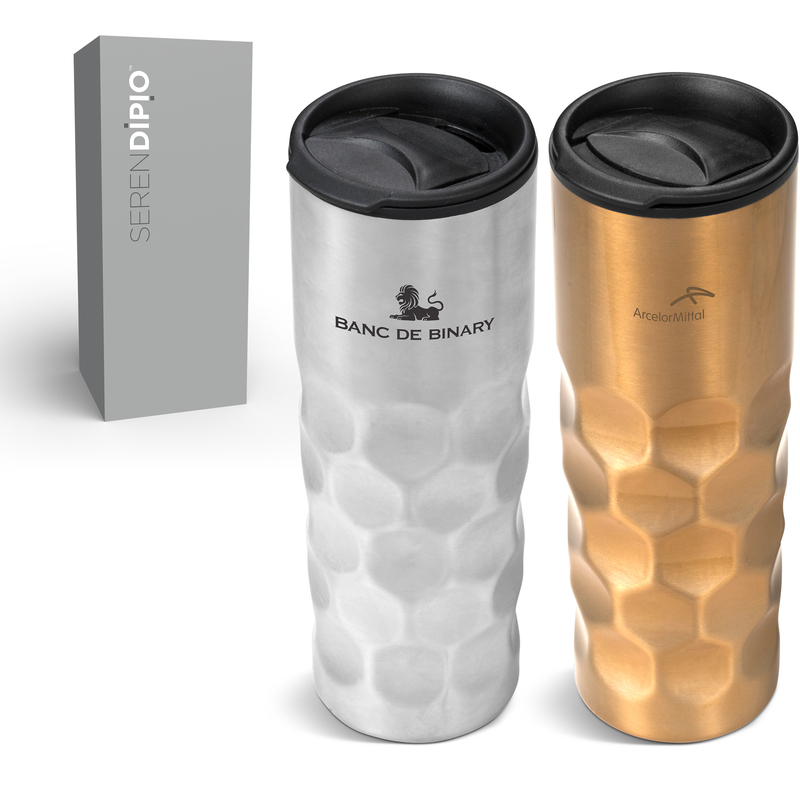 Unique design with transparent acrylic outer, 1 x 500ml double walled flask: 2 x matching mugs. Includes a black carry pouch with shoulder strap. 2 x white ceramic which will look great branded with our full colour digital transfer. A perfect travel or outdoor gift. 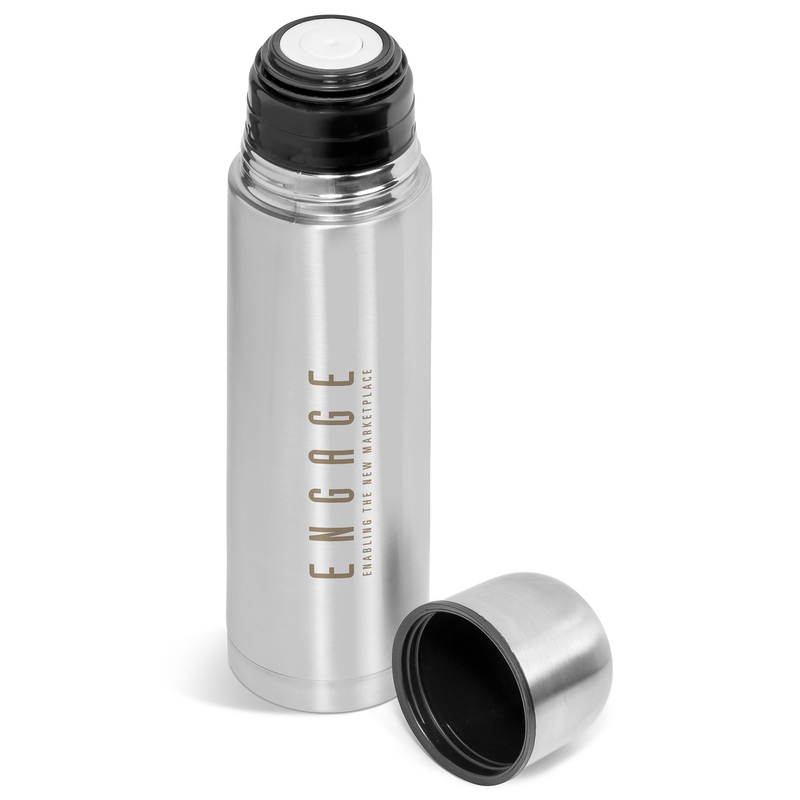 Double walled flask with an easy pour button release which auto closes when lid is closed. BPA free. 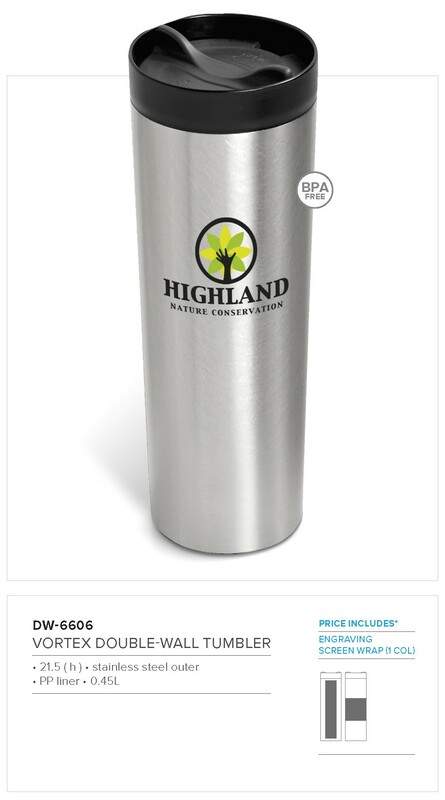 Includes 2 x stainless steel mugs with PP lid and handle. Comes in a black pouch with carry handle. BPA free. 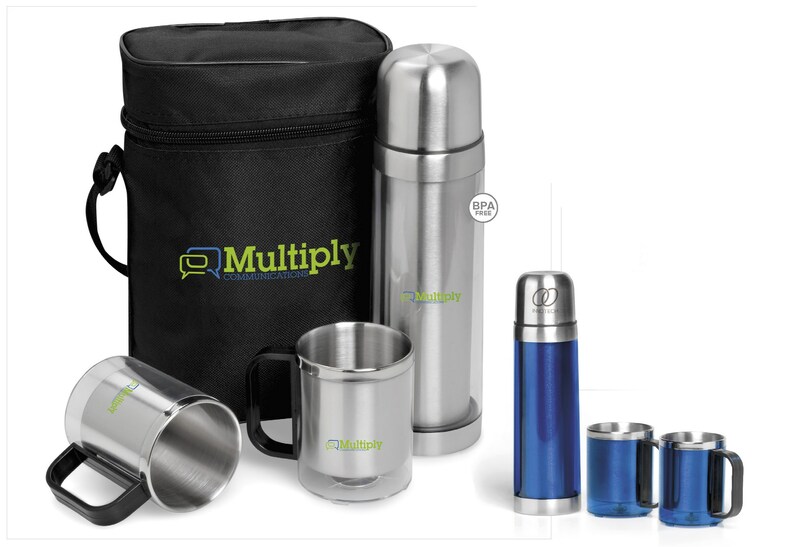 Branding on both flask and mugs. Branding can be done on all three components. 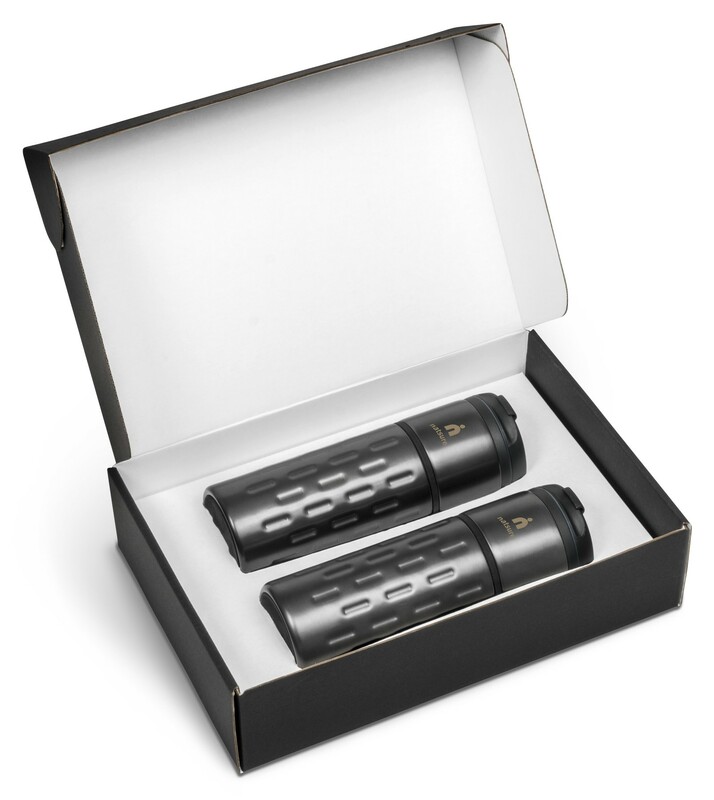 A great travel set for two. 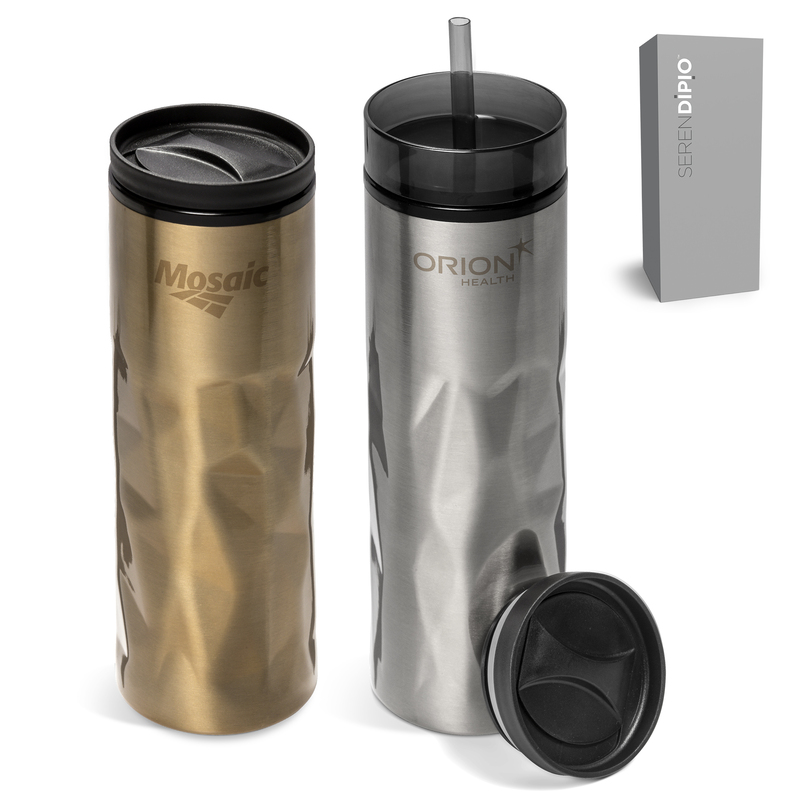 2 x stainless steel double walled travel mug with PP liner , handle & lid with slide lock. 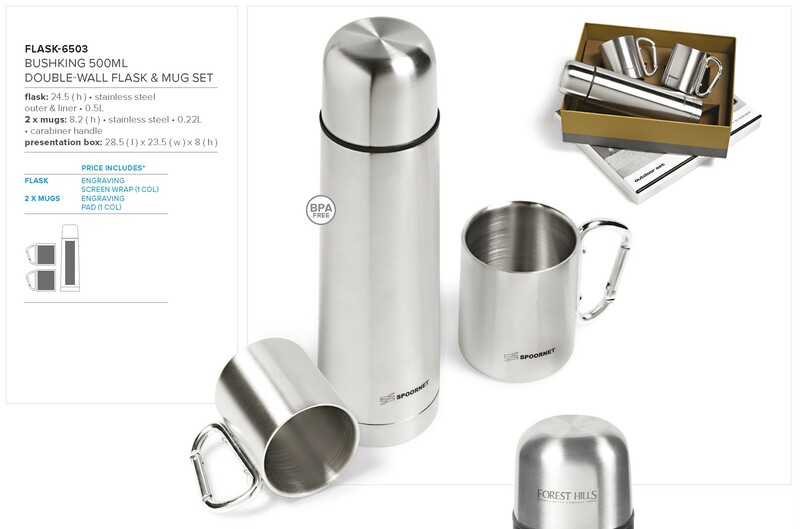 Flask has easy pour button release which auto closes when cup lid is closed. This stunning set makes a great outdoor or travel gift. 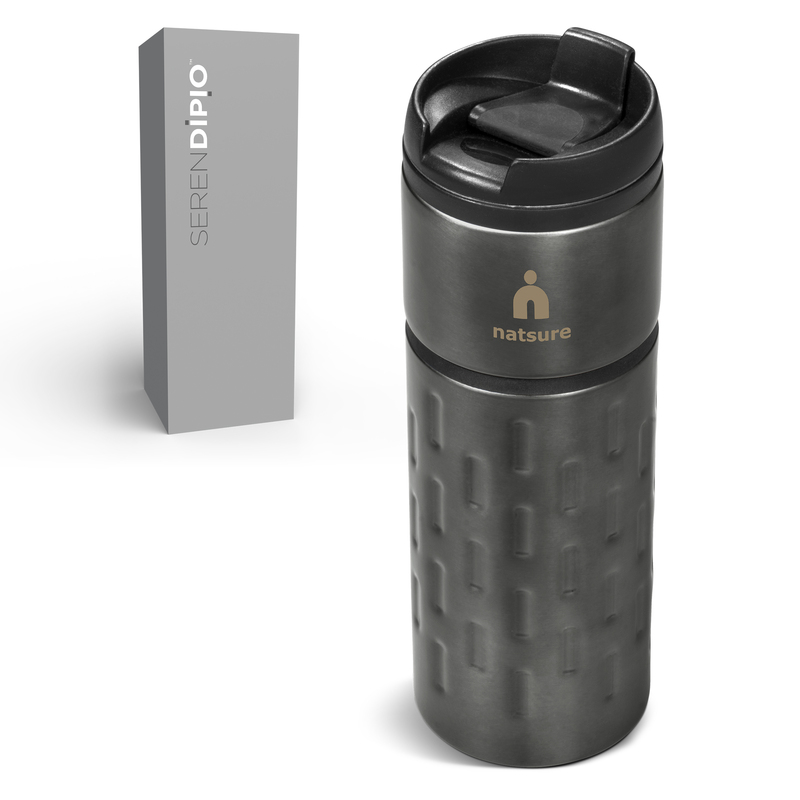 Double walled flask with an easy pour button release which auto closes when lid is closed. 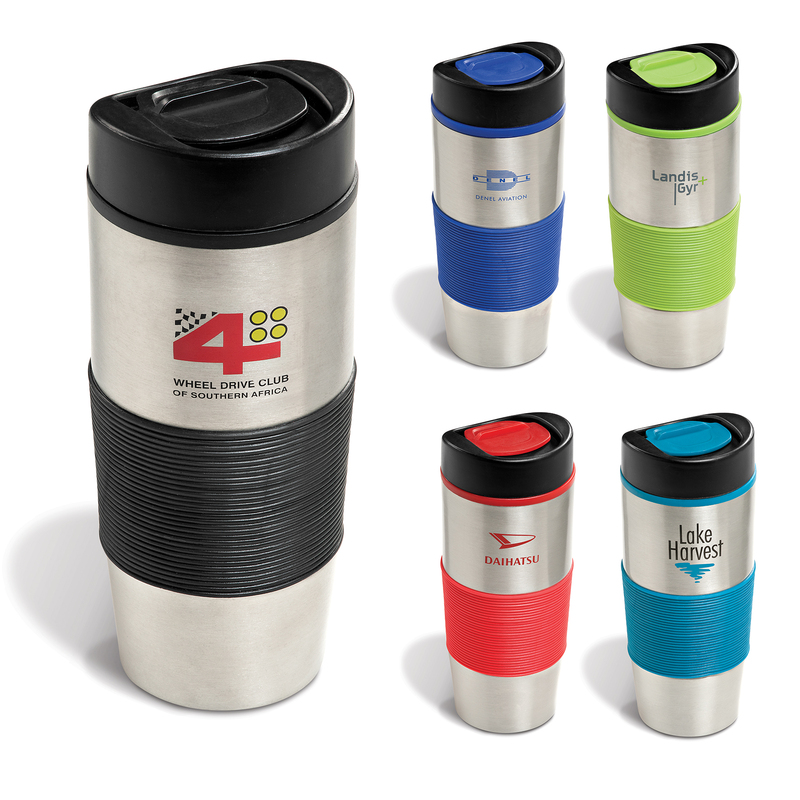 Includes 2 x stainless steel mugs with carabineer handles. 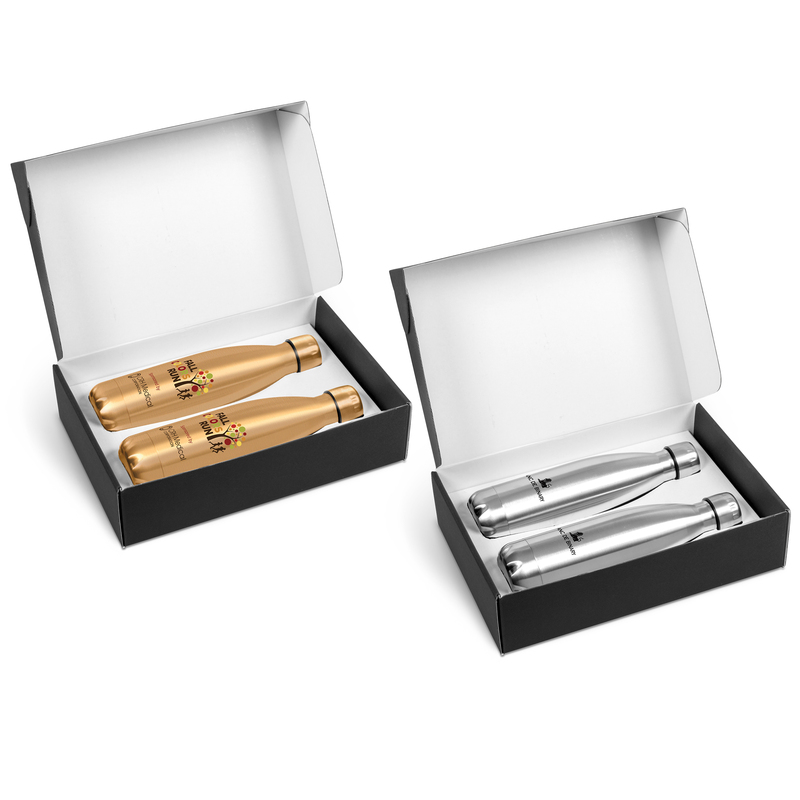 Comes in a deluxe pre-branded presentation box. BPA free. 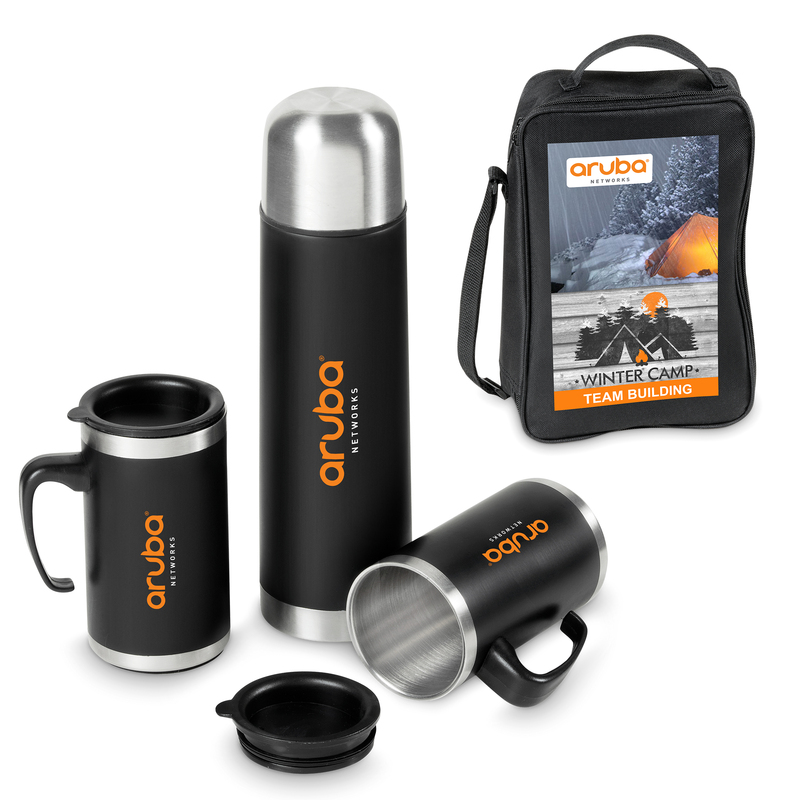 Branding can be done on both flask and mugs. Next postLunch boxes . Cutlery sets . Protein shakers .